Thanksgiving is one of the most anticipated holidays of the year. It is a time of gratitude when family and friends gather to share delicious food. 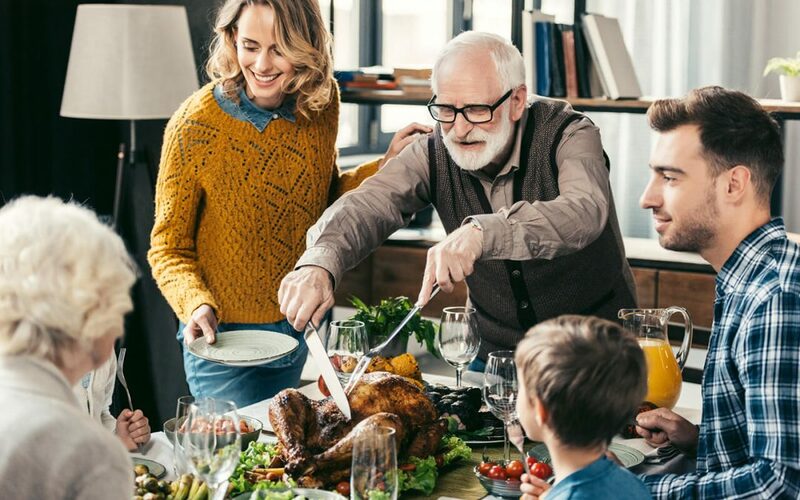 To keep your holiday safe and healthy, there are four Thanksgiving safety tips that you should follow. Having a fire in your fireplace on Thanksgiving creates a cozy atmosphere for your festive gathering. But before you start an indoor fire, make sure that your fireplace is safe and ready. The best way to do this is to first clean your fireplace thoroughly of debris, ash, and soot. Once it is cleaned out, you can see if there are any cracks or crumbling areas that need to be repaired before the holiday. It’s also a good idea to have your chimney swept before using your fireplace. The last thing you want is for smoke to billow into your home or for a chimney fire to start because the chimney was clogged. If you have concerns about the integrity of your fireplace or chimney, call a local home inspector for a professional opinion. It’s important for kids to stay out of the kitchen when the adults are preparing the meal. With so many different dishes being cooked, it is bound to get chaotic. Cooking the food for your holiday meal requires hot ovens, open flames, boiling water, sharp knives, and scorching pans. Every one of these items could burn or injure a child. Among the most important Thanksgiving safety tips for protecting children is to keep the kids away from the kitchen. A temporary baby gate will work wonders. Enlist the help of a family member to babysit the children in a dedicated play area. Deep frying the turkey is a potentially dangerous Thanksgiving Day trend that’s gaining in popularity. A surprising number of house fires and accidents happen when deep frying a turkey. If you choose to deep fry your turkey, do it outside, far away from any structure and people. Keep a fire extinguisher with you and be prepared. Candles are a nice touch when you’re creating the perfect atmosphere for your Thanksgiving Day dinner. While lit candles are a nice addition to your dinner table, they’re also a fire hazard. Anything can cause a lit candle to tip over and catch your home on fire. If you’re following Thanksgiving safety tips this year, switch to LED candles. You can find options with a realistic flicker and even some that have remote controls. Morgan & Associates Inspection Services provides home inspections to Middle Georgia. Contact us to book an appointment.